Mission Hills Volcanic Mineral Springs extracts pure mineral water from 800 meters below ground, a magmatic source from geothermal activity over hundred centuries ago. The circular form of southern China’s traditional rural dwellings, known as Fujian Tulou inspired the architectural design of the Mineral Springs buildings. The bamboo and volcanic rock construction fosters a natural and relaxing mood, while a 500-meter-long bamboo walkway beautifully lined with lush green gardens surrounds the steaming springs area. The word “SPA” is taken from Latin phrase “Solus Per Aqua”, meaning “health through water”. Originating in ancient Rome, spas have been popular in Europe since the 18th century. By the end of the 19th century, spa treatments started appearing in Britain and France before finally gaining widespread appeal in the 1960s. China embraced the spa culture in the mid-90s but added elements of traditional Chinese medicine, creating a unique East-meets-West spa experience. 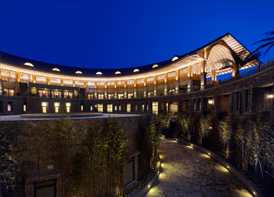 Haikou’s Mission Hills Spa comprises a grandiose main spa building, elegant spa villas, private treatment suites, a ritual garden, wellness pavilion, spa cafe and retail boutique. The facility features 90 well-appointed spa treatment suites offering a comprehensive array of treatments and rituals that are inspired by natural ingredients and elements indigenous to Hainan. The holistic wellness experience and gracious spa services present savvy spa-goers with the ultimate in total restoration and rejuvenation.